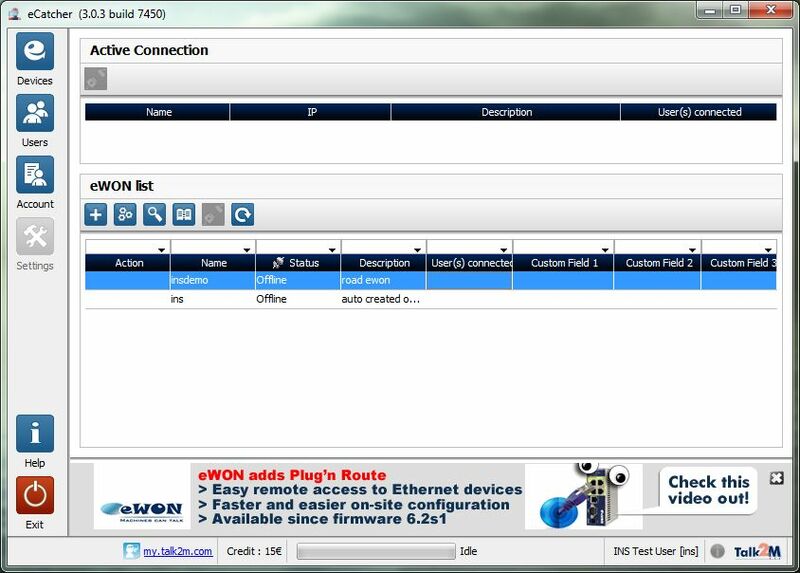 In this post, we'll go through the steps required to get your eWON connected to Talk2M. 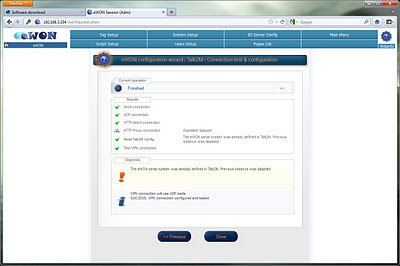 This post assumes you've already taken the preliminary steps of Updating eBuddy, Setting the eWON IP Address, Upgrading eWON Firmware and connected your eWON to the Internet via a Hardwired connection or Cellular connection. Running eCatcher should present the following Login dialog. 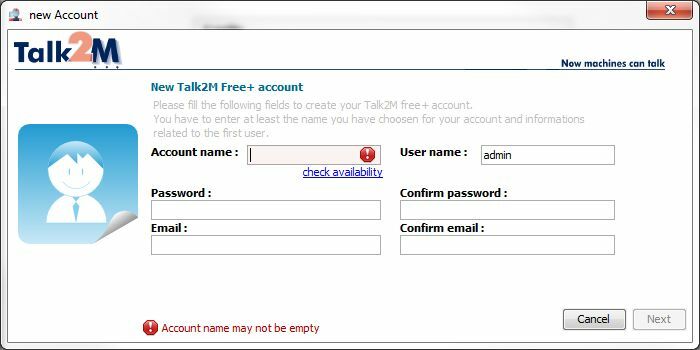 Assuming you don't yet have a Talk2M Free+ account, click the "Create a Free+ account" hyperlink located below the "Account" dialog box. Complete the following form to create your account. 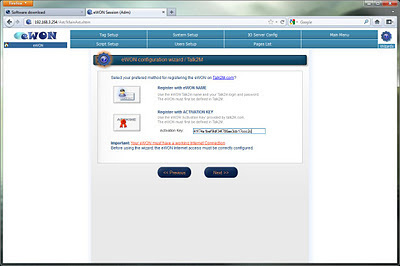 After your account is created, log in using your new credentials. Your eWON list will be empty. 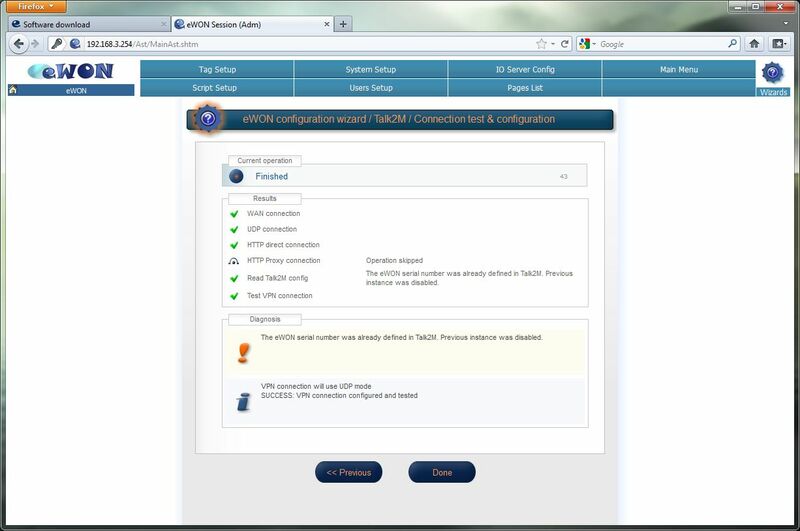 I already had one device tied to my account but I will be adding a new unit here to demonstrate the complete process. First, click the "+" sign just below "eWON list." Here you will type a name for the eWON you want to add, a description, and the connection type. The connection type confirms how the eWON is connected to the Internet. 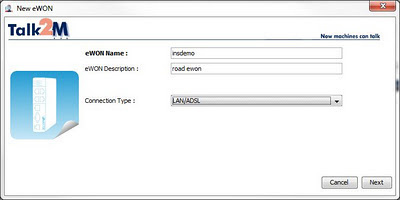 Select "LAN/DSL" for hardwired-connected eWONs and "GPRS/EDGE" for cellular-connected eWONs. You should now see the eWON you just added in the list. Under "eWON list", select the Gears icon located just to the right of the "+" icon. 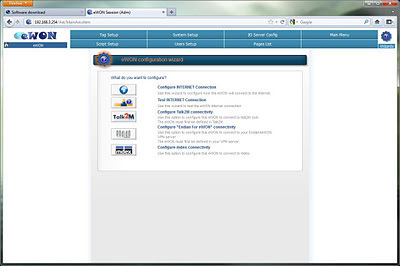 From this page you select the Wrench icon, the third available icon under "eWON Detail." And here's what we've been working for. 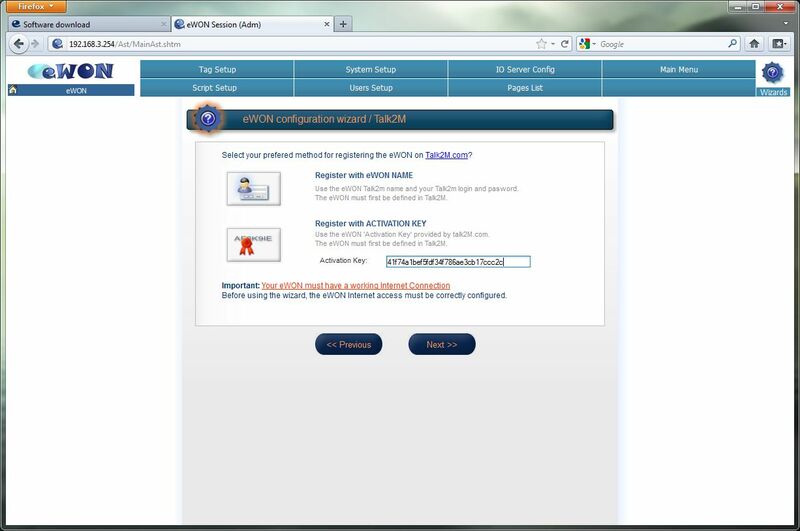 Copy the Activation Key shown here; we will be using this in the Talk2M configuration wizard of the eWON in an upcoming step. NOTE: I strongly encourage you save this key into a notepad document, in case you want to perform the next step at a later date or time. With your PC configured such that it can reach the eWON LAN IP, type in the eWON LAN IP into your browser to reach its web configuration. 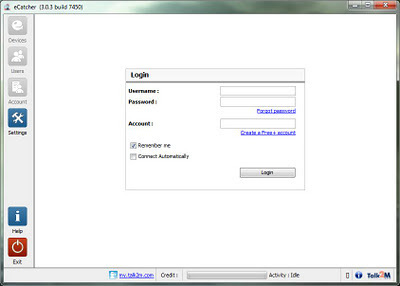 You'll still be using device defaults "adm" username and "adm" password until you configure otherwise. 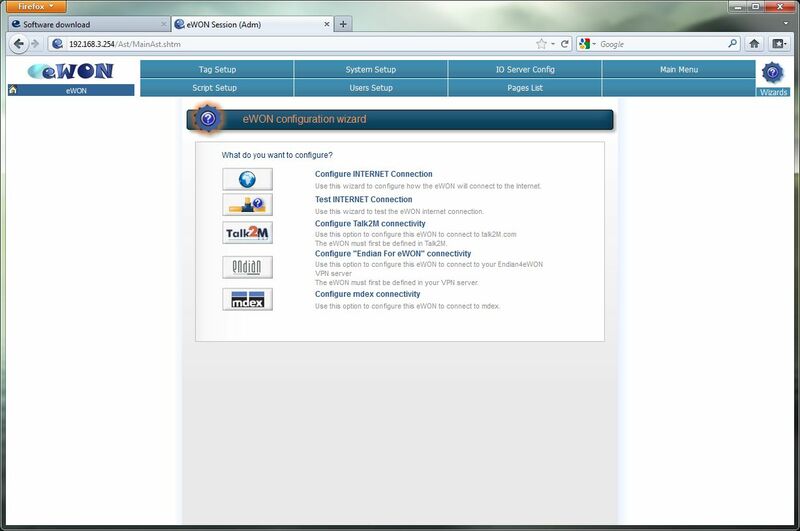 After selecting "Configuration" at the top right and then selecting "Wizards" on the subsequent page you should see this. 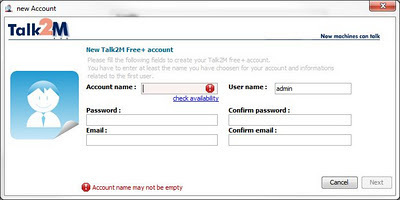 After selecting the "Configure Talk2M connectivity" icon, hit "Next > >" on the first screen, then select "Register with ACTIVATION KEY" and paste the key you copied from eCatcher earlier. Hit "Next > >"
The eWON will step through a series of tests and if all goes well you should see the following. Hit "Done." 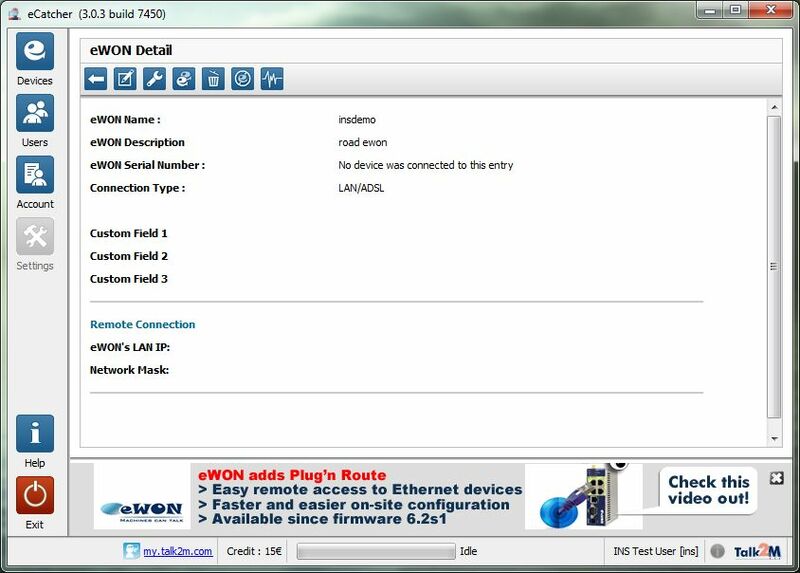 This confirms that your eWON is successfully connected to Talk2M. Let's continue by Connecting to the eWON and Remote Devices using eCatcher.